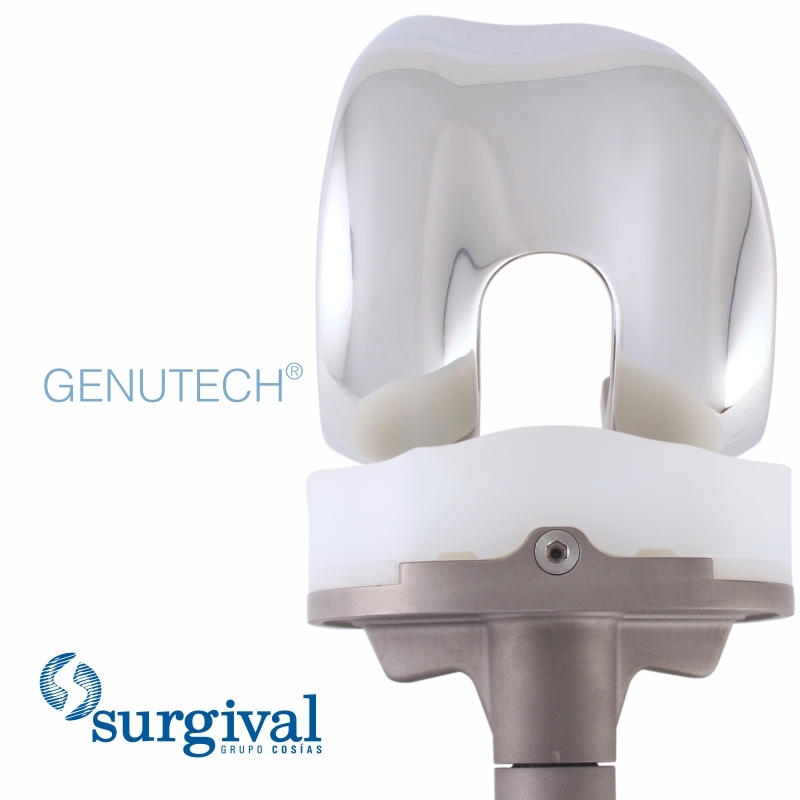 GENUTECH® total knee system, indicated for knee arthroplasties, has been designed and developed by Surgival to provide an optimal combination of strength, mobility, fixation and durability, for both cemented and uncemented requirements. This knee system allows to respond both to those arthroplasties that will preserve the posterior cruciate ligament (NPS) and those that opt for its non-preservation (PS). Maximum congruence to minimize stress and reduce friction and wear. The design of the condyles allows reaching 140º of flexion. Restriction of mobility associated with the choice of PS or NPS model. The femoro-tibial joint replacement should always have a size match between the femoral component and the insert. The design of the patellar canal of the femoral component allows a smooth and anatomical path of the patella throughout the range of flexion. Total modularity between tray sizes and tibial inserts, for both NPS and PS systems. Obtaining a knee prosthesis system highly adaptable to each specific case. Double fixation: primary by antero-posterior and secondary clipping with bolt, which ensures high assembly reliability. This primary knee prosthesis system also allows the use of straight stems in the tibial area, as well as augmentation blocks in order to cover any possible moderate tibial bone deficiency during primary surgery. The system also allows the use of femoral supplements (distal and posterior) in order to cover any possible moderate femoral bone deficiency during primary surgery. Its instrumentation, based on the innovative EASY PLUS® concept, has been designed with two objectives in mind: to facilitate the work of the surgeon and to minimize the risks for the patient.